For the contact center industry third party applications may refer to hardware manufacturers or software development companies or possibly a company that does both. It is a name that is given to a company that produces products for another company’s product, original equipment manufacturer, OEM. Below is an example of an OEM supplier and just a few of the products from third party application providers. It is almost impossible to develop hardware or software that meets all needs for all customers. The OEM does not have the features and/or benefits that third party application offers. The third party application revenue is not worth the development and support costs to the OEM. Your business needs are met. All businesses are unique. You have challenges in your call center that the OEM product cannot fulfill. 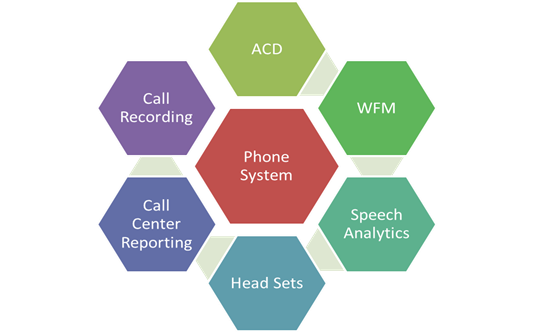 The third party applications can meet those needs and help reduce the challenges you have in the call center. Your business requirements are met. As a business you have requirements that must be met on a daily basis. These requirements if not met can affect your SLA agreements, senior management demands and customer expectations. Cost savings. The third party application exists, does not need to be designed and developed by your business internally. Long term business relationship. By working with the third party vendor you are able to build a long term relationship with a company that will listen to your needs and can plan on future changes you might need. There are other advantages and benefits by deciding to use a third party company. The concerns and options below address these. There are concerns about using a third party application or hardware vendor. These are real issues that must be addressed prior to working with the new vendor. Do not overlook these concerns regardless of what the third party company says. They are looking to make the sale; you should be looking out for your business. Compatibility – is the hardware / software fully compatible with your platform, security requirements, network, etc. Get documentation from the third party that fully answers your compatibility questions. Compliance – is the hardware / software compliant with the platform, network, domain, etc. Have they done the compliance testing or are they avoiding the testing for some reason? Compliance is not always needed but if your internal policies and procedures require compliance follow through with the third party vendor. Have them explain why the compliance is not required and get that in writing for future discussions. Cost – the benefits of a third party vendor is the cost savings. However look into everything that you need both now and the future. What happens when you need a new OS, or have migrated to a new platform or require a higher level of security? At what cost will this vendor be able to meet these changes. Always talk about the future with any third party vendor before making the decision to purchase from them. When investigating third party software / hardware do not be afraid to look at multiple vendors and do a comparison. Consider all options not only cost! Just because one vendor is cheaper than another does not mean they are the right vendor. Look at compatibility, compliance, features, benefits, your future requirements, cost, their business stability, their plans for future development, etc. You have multiple options when it comes to your application requirements. If the application is not available from your OEM supplier do not look elsewhere. Explain to others internally that the application is not available and continue to deal with the internal business challenges you are having in the contact center. This is not the best approach but it is an option. The overall business revenue loss could be significant but you are also aware that you are not going outside your OEM provider. Wait for the OEM to create the application you are looking for that will solve or reduce the business challenges. The delay is better than doing nothing at all. You will need to find out what the schedule is from the OEM supplier regarding getting the application you require. Contract with the OEM to produce the application you require. Some OEM’s will agree to a contract which keeps your business relationship with that supplier intact and growing. You will need to consider the cost, future development of your application, will it be “your product” or can it be resold by the OEM, your future needs, flexibility of the application and stability. On the internet today there are low cost hardware and freeware applications that will meet most of your needs. However, whenever something is free or very low cost you are opening your door to other challenges. Will the application or hardware truly meet your needs, what support is available, future compatibility with your platform and your OS, virus and security issues, future development of this low cost of freeware, internal learning curve on the low cost hardware or freeware and long term internal support of this application? Work with a third party provider that is compatible with your platform, they have past compliance testing, the have on-going future development plans, they are a stable organization and they will support your business and future needs. As a contact center manager you may not have enough time or software / hardware knowledge to be able to find the third party application provider. You can use your internal IT department to help you find the best provider of the application. You can also work with a channel partner (reseller) and have them do the research and bring you multiple options. Purchasing third party applications that will meet your needs is a cost effective, secure and wise idea. It may have been nice if your OEM platform provider could have met your needs but that is not always possible. Rather than continue to suffer the internal costs of not being able to reduce or eliminate daily challenges purchase the third party applications. Working with a channel partner or doing the investigative research yourself is a personal business decision. Be sure to do a true comparison of the third party applications and never view cost as the only decision maker.